Place the cream cheese and honey in a mixing bowl and beat with an electric mixer on medium-high speed until creamy and smooth. Set aside. Add the milk to a small, heatproof prep bowl and sprinkle the gelatin over the top. Stir to combine. Bring about 3/4-inch of water to a simmer in a small saucepan and set the bowl of milk and gelatin inside. Stirring constantly, heat the mixture until the gelatin dissolves completely. Remove from the pan and set aside for about 2 minutes to cool. Add the cooled gelatin-milk mixture and yogurt to the cream cheese and honey and beat on medium-low speed until thoroughly blended. Pour the filling into the baked pie shell, smooth the top and refrigerate until very firm, a minimum of 6 hours. 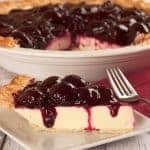 To make the topping, place the cherries in a medium saucepan and add the sugar, lemon juice, brandy and 4 tablespoons of water. Cook over medium heat, stirring often, until the cherries are tender, 5 to 7 minutes. Taste and add a little more sugar if needed, then raise the heat to medium-high. Whisk the remaining 2 tablespoons of water together with the cornstarch until well combined. Add to the cherry mixture and stir until the liquid has thickened to the consistency of a thick syrup. Transfer to a bowl and allow to cool. Cover and refrigerate until needed. Just before serving, spread the cherry topping over the pie. Be sure to refrigerate any leftovers. If cherries aren’t in season, you can replace them with 4-1/2 to 5 cups of strawberries (hulled and halved lengthwise), blueberries, raspberries or blackberries. The first time we made this pie, we used a medley of berries and spiked the mixture with a splash of rum.